Dhaba is a road side restaurant, which are famous for their quick and delicious food along the road sides, Dhabas are used by travellers and truckies en route.. Dhabas has some distinct flavours and are famous for their Daal. 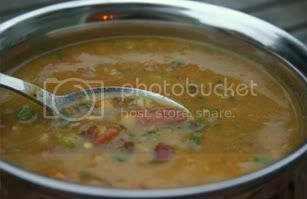 TIP: To cook Dhaba style daal, the when you put Garam Masala, let it get overcooked ( burnt) slightly. This gives the usual Dhaba Style Flavour.